April 28, 2017 at 8p.m. The return of Charles II and the monarchy brought a resurgence of pomp, pageantry and the salacious to Restoration England, which is expressed in music by Jenkins, Locke, Lawes, Humfrey, and Purcell. June 16, 2017 at 10a.m. May 7, 2017 at 7p.m. Joining in a recital of Paulina Francisco to sing songs from the late Renaissance with special attention to the Concerto delle donne of Ferrara. March 3, 2017 at 8p.m. Feb. 4, 2017 at 7:30p.m. With harpist Linda-Rose Hembreiker and flutist Stephanie Getz. Dec. 11, 2016 at 2:00p.m. and 4:30p.m. Dec. 2, 2016 at 8:00p.m. Friday, October 7, 2016 at 8p.m. Rotem Gilbert leads the USC Thornton Baroque Sinfonia in a program of virtuosic music from seventeenth-century Italy. The concert will feature virtuosic Italian music by Claudio Monteverdi, Luzzasco Luzzaschi, Barbara Strozzi, Luca Marenzio and Dario Castello, as well as a fiery Vivaldi bassoon concerto performed by Leah Kohn. September 11, 2016 at 7:30p.m. A Collaboration with harpsichordist, Robert Blake and Baroque cellist, Marylin Winkle visiting the works by Italian female composers from the early Baroque period. Selections include songs by Francesca Cachini, Barbara Strozzi, and Chiara Maria Cozzolani among others. Concert I 8/8, Concert II 8/8, Concert III 8/9 at I-3p.m., II-8p.m., III-8p.m. August 14, 2016 at 2p.m. June 22, 2015 at Doors open at 6:30p.m. Concert begins at 7p.m. Concert is free admission. Program includes selections from the Great American Song Book (Songs by George and Ira Gershwin, Rogers and Hammerstein, and Harold Arlen), Traditional English and Scottish folk songs, and music by John Dowland, and Joaquin Rodrigo. August 31st, 2014 at Door open at 1:30p.m. Music begins at 2p.m. Concert is free admission. Program includes music by John Dowland, Fernando Sor, Joaquin Rodrigo, and Isaac Albeniz. Music performed are pieces written for voice and guitar (or lute) and songs in English, Spanish, Italian, and French. 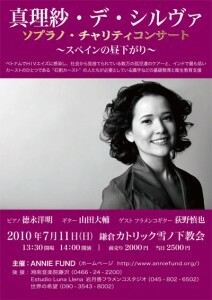 A charity event sponsored by NGO, ANNIE FUND in Japan. All the proceeds will go to building a school in Pune, India.